After thoroughly testing and further developing the Soufflearning method over the last several months, on April 28 we organized a national dissemination workshop for Spain. 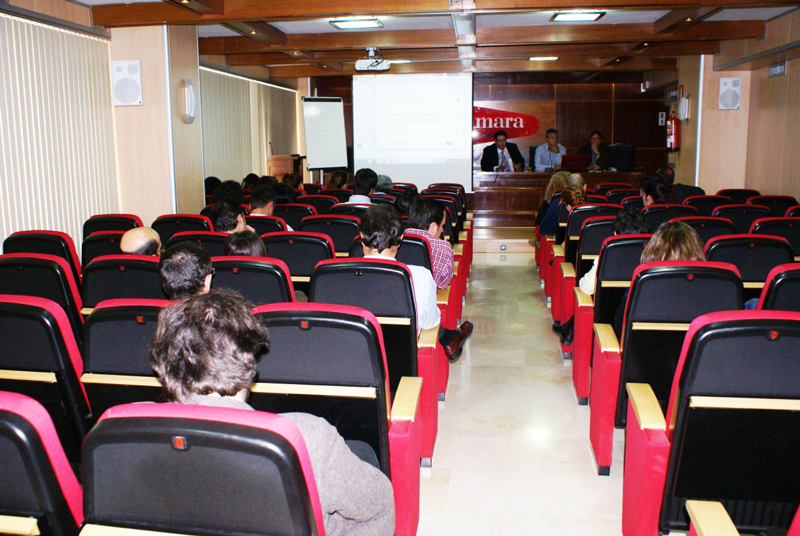 The event, which was hosted at our partner organization the Badajoz Chamber of Commerce, targeted stakeholders in the training and development field and members of the media. About 30 participants from different areas of vocational training and work-based learning attended the workshop to find out more about this innovative “on-the-job” training method. Norbert Steinhaus from Wissenschaftsladen Bonn opened the conference with a presentation on the background of Soufflearning and the overall European experience to this da. Afterwards each of the Spanish partner organizations reported their own observations and insights from conducting Soufflearning trainings in Spanish companies. Antonio Serrano (Badajoz Chamber of Commerce) followed up by laying out the specific benefits of the methodology, especially its applicability in micro-enterprises. Ana Azaceta (CEAJE) and Jesus Cimas (CIFP Aguas Nuevas) then talked about their tests carried out in different businesses and environments. After the theoretical part, attendees had the chance to gain direct practical knowledge of the Soufflearning method. Pilar Contreras, consultant and trainer involved in carrying out Soufflearning trainings in Badajoz, conducted different role plays to give participants a working knowledge of what to expect from the training methodology. Finally, workshop attendees were invited to voice question and observations they had during the workshop. They were also asked to give input where they see opportunities for implementing Soufflearning in their own environment and add their own experiences. Overall, the workshop was seen as a great success. Attendees left satisfied and with lots of new input for their own work. We want to thank everyone who attended and hope you enjoyed it as much as we did.